You've probably already seen many pictures of one of the most magnificent geologic features in the world, the Rainbow Mountain all over the Instagram, and wonder if those photos are real or if the effect is only a work of well-skilled users of photoshop. After our visit, we can confirm that Rainbow Mountain is no fake - those colors are real, but to enjoy Rainbow Mountain in its glory, we recommend you to plan your visit on a sunny day when colors are the most vivid. When it is raining or cloudy, colors can be darker, and it would be hard to avoid disappointment. For us, the visit of Rainbow Mountain wouldn't be complete without hiking through Red Valley. Until today, we can't even believe how is it possible that a place similarly beautiful (for us even more beautiful) as Rainbow Mountain is so scarcely visited although the place lies only 15 minutes walk from the heavily visited viewpoint. Are you planning on visiting Rainbow Mountain and Red Valley? Great, but there are things you should know before coming. Also, if you are looking for more inspiration about what to do near Cusco, you can read our posts about hiking the famous Inca Trail, the Salkantay Trek or visiting the Sacred Valley. Rainbow Mountain, also known as Vinicunca and Montaña de Siete Colores (Mountain of Seven Colors), lies in a remote region of Peruvian Andes, approximately three hours drive from the former Inca's capital, Cusco. It is a part of Vilcanota Mountain range as well as Ausangate Mountain, with 6384 meters, the highest mountain in Cusco area. The settings of Rainbow Mountain was a big surprise for us. Because everyone is focusing only on the colorful mountain, honestly, we had never thought of its surroundings. But what a surprise when we turned our heads from the main attraction and realized that the view of the other side of the valley is equally astounding. You might wonder how is it possible that the big boom of the Rainbow Mountain has started just recently. A multi-day, also increasingly popular Ausangate trek leads around this mountain, so how come that no one (even local people) knew about it earlier? The answer is maybe more obvious than you would have expected: global warming. About five years ago, global warming had caused the ice to melt, and the colorful mountain has appeared underneath. It didn't take long until hikers and guides walking the Ausangate Trek noticed the new attraction and shared it with the world. Since then, approximately 1000 people visit the Rainbow Mountain every day. As usual, the popularity has its positives and negatives. At the end of the day, it will be only on us (travelers) on one side and Peruvian government and people involved in the tourism industry on the other side, how will we be able to manage the sustainability of this place. When looking at the valley leading to the Rainbow Mountain and the mountain itself, we couldn't stop wondering where all the colors come from. The explanation is more complex as there are many reasons why the Rainbow Mountain is striped with multiple colors such as yellows, greens, reds, and purples, but two main reasons are called weathering and mineralogy. Different layers of sediment rock change colors when exposed to environmental conditions such as wind or water, and we cannot forget that the high altitude also plays an important role in this process. That's why sediments of iron oxide turn red or iron sulfide turn into bright yellow. Nature is sometimes unbelievable, right? Because of the eyes catching and almost unreal colors, travelers sometimes can't wait to see the Rainbow Mountain and sign in into a tour the very next day after arriving in Cusco. But this very often happens to be a big mistake. You shouldn't ignore the fact that the Rainbow Mountain and the whole trail lies at a high altitude. The hike starts 4600 meters above sea level, and the viewpoint lies even over 5000 meters; at 5036 meters above sea level to be precise. READ MORE: Are you planning on visiting Peru and love hiking in high altitudes? Huaraz offers one of the most incredible sceneries in the world. Hike to the famous Laguna 69, visit receding Pastoruri Glacier at 5000 above sea level, trek to beautiful Laguna Paron or stunning Laguna Churup. We cannot stress enough how important is acclimatization before you do the trek, because the altitude sickness is no joke and you can ruin your entire stay in Cusco or Peru overall. We met a girl who hiked the Rainbow Mountain trek two days before she had the Inca Trail booked but she got seriously sick during the trek, and she couldn't hike the Inca Trail and spent several days in the hospital instead. Although you can never know how the altitude will affect you (it has nothing to do with physical ability or how your body reacted to altitude previously), there are several simple rules you should follow to maximize your chances to enjoy the trek. Stay in Cusco at least two or three days before the hike to adjust your body to a higher elevation. Drink enough water, do not eat heavy meals and try to do some light physical activity. Do not forget that health and safety always go first, so in case you start feeling dizzy or a headache gets stronger during the hike, do not continue and get back to a lower altitude as quick as you can. Weather in high mountains can be unpredictable, and you should come well-prepared. The dry season in Peru is from April to October, but it can rain (or even snow) any time of the year at this altitude. Apart from the rain, you should also expect cold winds and strong sunshine (don't be fooled by clouds). The trail to the Rainbow Mountain is not extremely hard or long in case you are used to walking a bit. You will gain a bit more than 400 meters on 5 kilometers. The path is obvious, can be slippery at places (especially after rain) and climbs gradually to the top apart from the last section which is pretty steep. What makes this trek difficult is the altitude so although you are an experienced hiker, take it slowly. It should take you about two hours to reach the famous viewpoint. When returning via Red Valley call yourself lucky. Not only you will be spoiled by amazing vistas, but the trail goes all the way downhill for 7 kilometers until you reach the parking lot where the bus waits. Very rewarding. Although the Rainbow Mountain deserves the hype, it is not the only fascinating attraction in the area. Rather the contrary. Only several hundred meters from the colorful mountain lies valley which offers incredible views and although the name suggests you will be overwhelmed by shades of red that's not entirely true. You will be blown away by the mixture of shades of red color AND astonishingly lush green patches of grass. 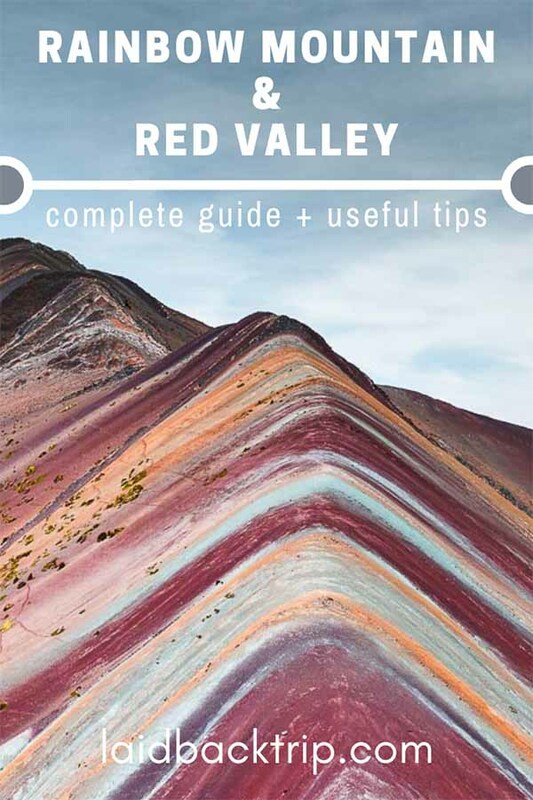 This combination is really eyes catching, and in case you're planning on visiting the Rainbow Mountain, you should also add Red Valley into your itinerary. Instead of walking back the same way, take a 2.5 hours detour through this natural marvel. You won't regret this decision. You have two options on how to book a tour to the Rainbow Mountain and Red Valley. Nowadays, many travel agencies in Cusco have a professional website, and you can make the reservation and pay online in advance. The only disadvantage is that the price usually is three times higher than when you book the tour directly in Cusco. Although we completely understand that it might be tempting to book the tour online and have everything set before your journey, to save money we recommend you to wait, and shop around in person - not only to secure the best rate but also to have a chance adjust your plans according to the weather forecast. Remember that the Rainbow Mountain isn't that colorful when it rains not mentioning that bad weather in 5000 meters can be even dangerous. We booked the full-day tour directly with travel agency in Cusco one day ahead. Included was English speaking guide, transport, entrance fees, breakfast and lunch for S/100 (the original proposal was S/120). You can see different prices for the same trip around Cusco, but do not forget to reconfirm with an agency what is in the price (and ask the agency to write it down for you on a voucher). If the price is too low, you will most likely have to pay entrance fees on the spot. Currently, there is no public transport running between Cusco and Rainbow Mountain parking lot. Still, you have two options on how to visit this place. Taxi | If you are traveling in a group of four (or don't mind to splurge), it is actually a good idea to book a taxi in Cusco at least one day in advance. The cost should be around S/300 with waiting. Do not forget that you still have to pay for food and entrance fees, but it gives you an advantage that you don't need to get up that early, and you can visit the Rainbow Mountain after the morning rush when all tours will be gone. Tour | The most popular way how to visit the Rainbow Mountain and Red Valley is taking a tour. The itinerary is almost the same for every tour operator (only if you wish to walk through Red Valley, you must specifically ask for it) in the city. You will be picked up around 4:30 AM at your hotel, and the drive to the base of the hike takes about three hours with a stop for breakfast. Then you hike approximately 3.5 hours to the viewpoint and back, or in case you chose to carry on to the Red Valley, it is 2.5 hours to the viewpoint of the Rainbow Mountain and another 2.5 hours walk via Red Valley to the parking lot. Then it takes another three hours drive to Cusco with a short break for buffet lunch in the same restaurant. The tour finishes near the Cusco's main square around 5 or 5:30 PM. Pretty long day, but the experience is well worth the early wake-up, long time spent in the uncomfortable van on an uncomfortable road and the exhausting hike. In the high season (in July and August), Red Mountain is visited approximately by 1000 people daily! And we must mention that we were there at the beginning of December and things did not seem very quiet by then either. In short, Rainbow Mountain one day trip has become one of the most popular things to do in when in Cusco, so do not expect to have it for yourself. If you want to enjoy the tranquil beauty of this place, instead of hiking the same way back, choose the Red Valley option. Only a fraction of all hikers (basically only our group) did this extension although we still don't know why. This section was the absolute highlight of this trip. Because of the unpredictable weather, it is necessary to pack a bit of everything. Pack rain and windproof jacket (down jacket also comes handy), long trousers or leggings, rain poncho, hat, sunscreen, lip balm, sporty t-shirt, and warm jacket. Having sturdy hiking boots is a must. Take plenty of water (at least 1.5 liters per person) and some snack (bananas or quinoa bars). Fully charged camera should go without saying. Only a few meters away from the parking lot stand plenty of local people offering horses for S/80 for a ride to the base of the mountain. In case you don't feel fit enough or want to enjoy the mountainous beauty from the horseback, go for it. Only be prepared that horses can take you approximately to two-thirds of the trail, but can't continue on the steepest part so to get to the viewpoint, you will have to walk anyway. WILL TOURISM RUIN THE RAINBOW MOUNTAIN? Before our visit to the Rainbow Mountain and Red Valley, we've read numerous articles disputing the impact of mass tourism on the area. Those articles were mostly negative, and the conclusion was usually strict: people, do not visit the Rainbow Mountain or you will ruin it soon. We respect everyone's opinion, although it can collide with ours, but in most cases, those articles were usually written by people who: got altitude sickness, did not have nice weather thus the mountain was not that colorful, and moreover, they visited the place by themselves, so they were already part of the problem. We think that the we must ask differently. Will badly managed tourism ruin the Rainbow Mountain? It is true that 1000 visitors per day is a lot, especially when you realize that people in the area only five years ago (some of course until now) worked as lama shepherds and lived (we think this hasn't changed yet) in such poor conditions we cannot even imagine (tents you can see on the hill close to the parking lot are not for animals but are actual homes) - in short, they have no idea how tourism work and have no experience dealing with foreign visitors - and we can't blame them. Tourism has already brought several hundred people back to their homeland, and they now offer horse services, sell handicrafts or offer refreshments along the path. Unfortunately, in our opinion, they at the moment don't know how to handle it and tourists can sometimes feel as walking wallets, especially when locals obviously only want money but there is a lack of an extra value. But there are two sides to every story. We believe that local tourism companies or the government should deal with this problem and teach local people how the system works - that locals can make money when offering a quality service and visitors will leave happy. But sadly today, we could only see that the only concern of the Peruvian government is to build a modern booth to sell tickets (although they haven't even built a much needed infrastructure to the site yet, or proper hiking trail). Also, visitors should be aware of the fragile alpine environment, walk on the designated path (there is not an official way so try to follow the most obvious way), use toilets along the way (for S/1) and climb only the viewpoint not the Rainbow Mountain itself. It should go without saying, but take only memories and pictures, leave only footprints. To answer the question: will tourism ruin the Rainbow Mountain? Hopefully not, but both sides, tourists and local people involved in the tourism must work hard on it. World Nomads Travel Insurance has been designed by travelers for travelers, to cover your trip essentials. Don't forget to arrange your insurance before arriving in Peru!